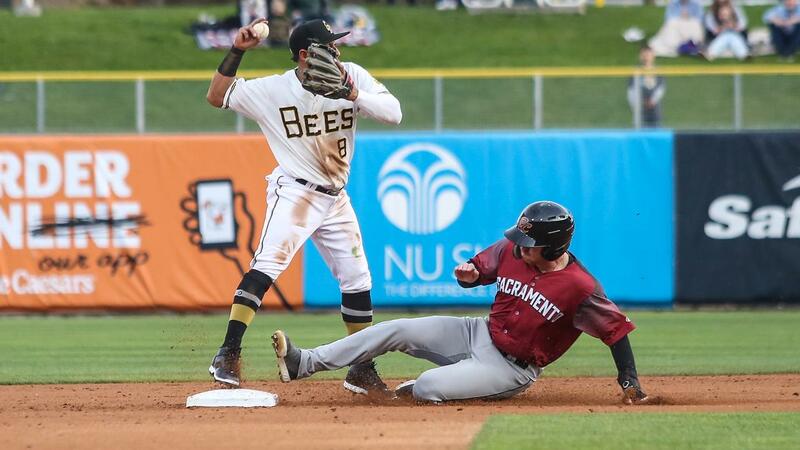 The Sacramento River Cats took down the Salt Lake Bees 2-1 on Sunday afternoon at Smith's Ballpark. Bees starting pitcher Max Herrmann turned in a solid effort in his Triple-A debut allowing two runs (one earned) in five innings but was tagged with the loss. Max, along with his brother Frank - a reliever for the 2015 Bees - became the second set of brothers to appear in games for Salt Lake in franchise history joining Jose and Benji Molina. The Bees bullpen backed Herrmann with four scoreless innings, including the first pitching appearance of the year for Jared Walsh who started the game at DH before finishing on the mound. Walsh struck out a pair in an inning of work. The Bees bats finished with six hits, but went just 1-for-9 with runners in scoring position on the day. Brennon Lund collected the only RBI of the game for the Bees after grounding into a fielder's choice in the eighth. Cesar Puello lead off the ninth with a single for the Bees and got to third base as the tying run, but Sacramento closer Sam Coonrod struck out Luis Rengifo to finish the game. The Bees homestand finishes tomorrow against Sacramento with a Monday matinee game with first pitch scheduled for 12:05 p.m.. Fans can purchase a hot dog, drink and ticket for $10 at www.slbees.com or take advantage of the Smith's Family Day offer by getting four tickets and four hot dogs for just $24 also at www.slbees.com.